If you like TWER, please consider becoming one of the 100. Thanks! There was no denying it—Auburn was the best team in the best conference in America. It was obvious, it was on the record. Which is why AU grad Will Collier felt fans attending or tuning in to the Alabama-Florida game on Dec. 4, 1993 deserved to know what they were actually watching: The SEC Consolation Game. Collier thought the best way to do that was just fly a banner over Legion Field and tell them. Collier, having just earned his Master’s Degree at the University of Texas, and Michael Deavers, his former roommate at Auburn, came up with the idea after Auburn upset the Gators on October 16, when it became obvious God wanted Auburn to win it all. There were still plenty of conference games left, but beat Arkansas and Georgia, and regardless the outcome of the Iron Bowl, Auburn, despite probation denying them their rightful spot in the SEC Championship Game, would have won the SEC “on the field!,” as an ecstatic Terry Bowden would shout in the locker room after Auburn did beat the Bulldogs in Athens a few weeks later. After 11 and 0! 11 and 0! 11 and 0!! !, it was a go. They decided to go with “38-35 (the score of the Florida game) AUBURN ‘BEST IN THE SEC’ 22-14 (the score of the Alabama game).” They picked up the phone. The plan was just to dial up a few hundred dollars, enough to keep the banner up in the air for maybe half an hour. Collier and Deavers only personally called few possible donors each, each from their shared hometown of Enterprise, Ala.
By midweek, checks were pouring in from all over the country. They two friends wound up with more than enough–the extra money was donated to the university–to fly the banner for the duration of the game, and they did. Ironically, Auburn’s sports information staff was responsible for press box operations at the game. It’s probably safe to say Housel saw it, too. 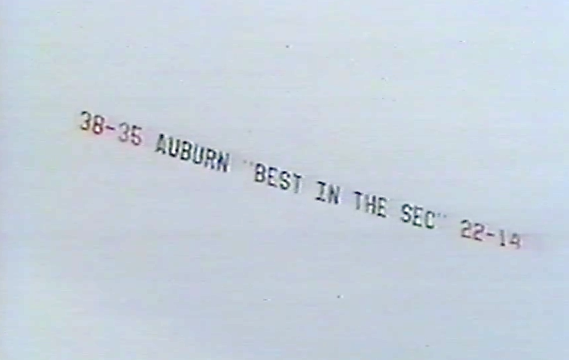 Related: That time large walkway tiles on Auburn’s campus were rearranged to spell ‘BAMA SUX’ in giant letters the day before the 1993 Iron Bowl.